Dramatic advances in laser technologies are enabling novel studies to explore laser-matter interactions at ultrahigh intensity. By focusing high-power laser pulses, electric fields (of orders of magnitude greater than found within atoms) are routinely produced and soon may be sufficiently intense to create matter from light. 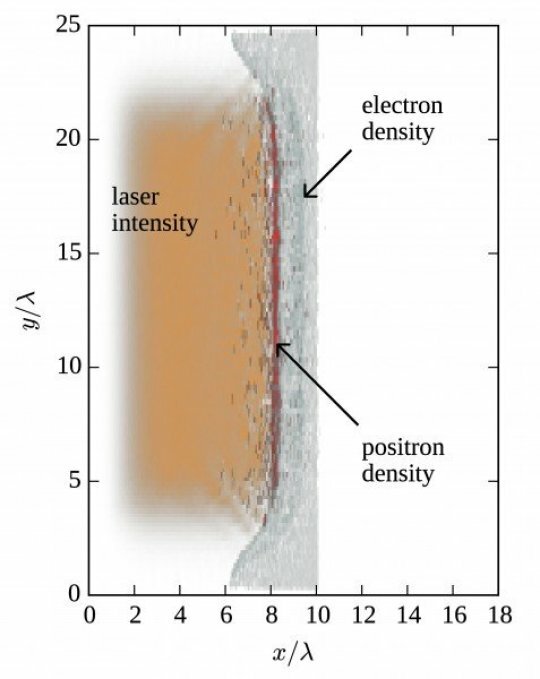 The distribution of the laser intensity (orange), the foil electron and foil ion densities (gray), and the positron density (red) in the x–y plane. The laser pulse propagates along the x-axis, while the foil surface is perpendicular to the x-axis. Now, intriguing calculations from a research team at the Institute of Applied Physics of the Russian Academy of Sciences (IAP RAS), and reported this week in Physics of Plasmas, from AIP Publishing, explain the production and dynamics of electrons and positrons from ultrahigh-intensity laser-matter interactions. In other words: They’ve calculated how to create matter and antimatter via lasers. Strong electric fields cause electrons to undergo huge radiation losses because a significant amount of their energy is converted into gamma rays — high-energy photons, which are the particles that make up light. The high-energy photons produced by this process interact with the strong laser field and create electron-positron pairs. As a result, a new state of matter emerges: strongly interacting particles, optical fields, and gamma radiation, whose dynamics are governed by the interplay between classical physics phenomena and quantum processes. But, what’s a QED cascade? For this work, the researchers explored the interaction of a very intense laser pulse with a foil via numerical simulations. They were also able to observe a distinct structure of the positron distribution in the simulations — despite some randomness of the processes of photon emission and decay. “By analyzing the positron motion in the electromagnetic fields in front of the foil analytically, we discovered that some characteristics of the motion regulate positron distribution and led to helical-like structures being observed in the simulations,” he added. So far, the researchers have focused on the initial stage of interaction when the electron-positron pairs they produced don’t significantly affect the laser-target interaction. Web Source: American Institute of Physics (AIP).